Do you want to start using task cards or adapted books with your students? Are you learning about farmers in your classroom and need leveled activities? 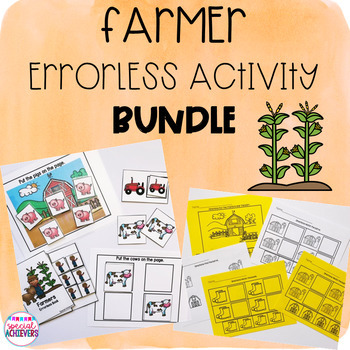 These errorless farmer activities are the perfect way to introduce these materials to your students. This set is perfect for preschool and kindergarten students, special education students, and students needing extra assistance. These activities can be made into file folder activities, used as activity mats, or can all be placed in a binder. Students are responsible for putting "farmer" themed items on the various mats (farm related backgrounds). There are 2 sets of task cards included. 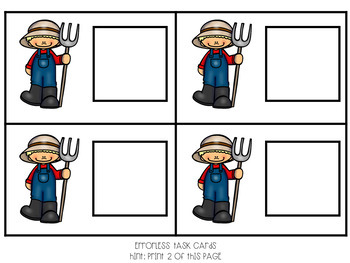 Farmers and tractors are included for the task cards. These can be used to introduce task cards to a student. In addition, it allows all students to be included if other students are completing other types of task cards. There are 4 sets of file folder activities included. These are similar to the activity mats, except these have specific places to put the cards. This allows students to start working on placing a picture in a designated location. This book is 6 pages long. 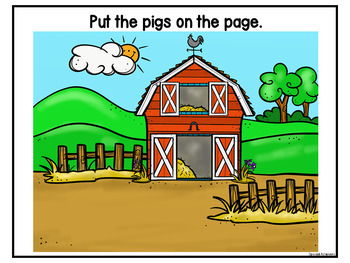 It requires the students to place the "farmer" on each page. This is a great way to introduce different vocab to the students, while still allowing them to be successful using errorless activities. Students are responsible for putting "farmer themed" items on the worksheets. 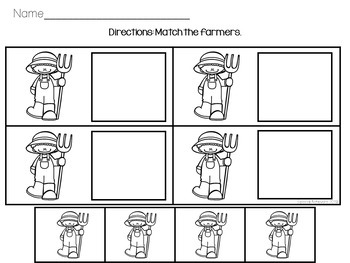 These worksheets help introduce students to farmer themed vocabulary. These cut and paste activities are errorless. These are printer-friendly! There are 4 levels of each worksheet included. They are all printer friendly. 4. Identification Worksheet Level 2- Students are required to find the corresponding picture on each page. Students can identify the items by marking the items in a variety of ways (pointing, dabbing, circling, etc). These worksheets are NOT errorless. There are two "incorrect" items on the page.